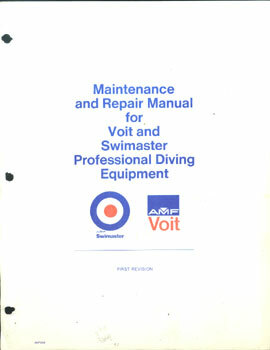 #BS77 - Basic Scuba by Fred Roberts. 1977 enlarged paperback edition with 488 pages, loaded with actual photos and exploded view drawings which amounts to the best scuba reference manual ever published for the scuba collector. Cover and spine show wear but the book is complete and intact and the inside pages are clean. Price $45.00. 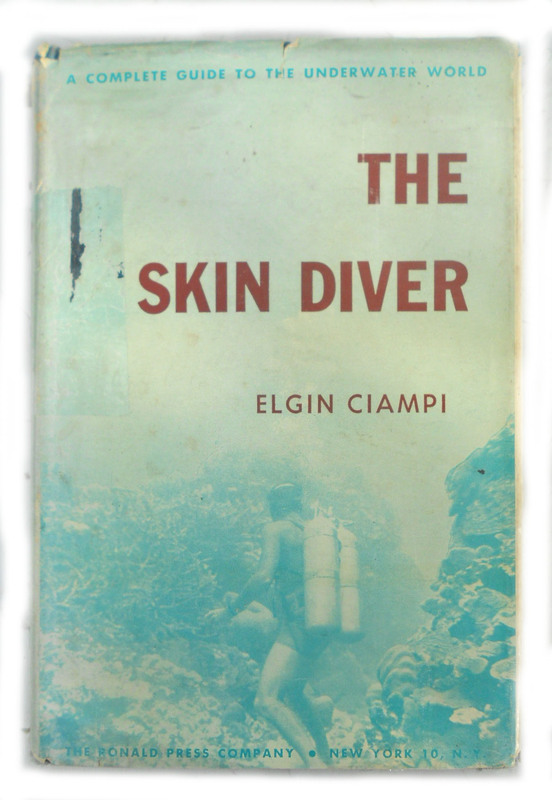 #TSD60 - The Skin Diver by Elgin Ciampi, the complete guide to the underwater world. Hardcover with dust jacket and 315 pages loaded with actual photos. Ex-Library copy with original dust jacket. 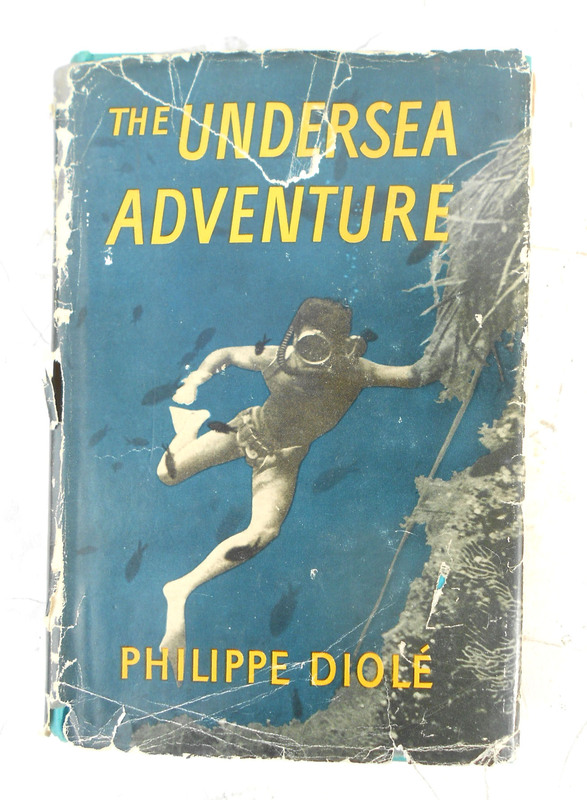 One of the best early scuba instruction manuals printed in 1960. Price $25.00. #USN63 - U.S. Navy Diving Manual (NAVSHIPS 250-538), July 1963. Several hundred pages, loaded with actual photos, charts and drawings. Covers deep sea diving (Mark V), open circuit scuba (Scott Hydro-Pak, USD AquaMaster), closed circuit rebreathers (Laru, Pirelli Model LS-901 and Draeger Model Lt. Lund II) and much more. Some stains near top of cover, otherwise manual is in excellent condition. Price $55.00. 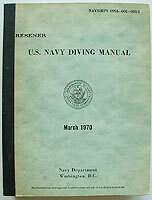 #USN70 - U.S. Navy Diving Manual (NAVSHIPS 0994-001-9010), March 1970. Several hundred pages, loaded with actual photos, charts and drawings. Covers deep sea diving (Mark V), open circuit scuba (USD AquaMaster), closed circuit rebreathers (MK VI), mixed gas and much more. This manual is in like new condition! 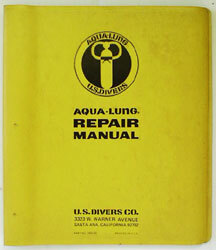 #ALRM - 1971 US Divers Aqua-Lung Repair Manual. Original 110 page dealer shop manual in 3 ring binder. Covers the complete overhaul of DW Mistral, DA Aqua-Master, Royal Aqua-Master, Calypso, Conshelf, Deepstar, Aquarius, tank valves, spear guns and more. Price $70.00. #BSSC - Safe Scuba, by the National Association of Diving Schools and William "Bill" Hogan. Third Edition 1973. Hardcover with 113 pages and tons of photos, charts, graphs and drawings. Covers all aspects of learning how to dive. Excellent condition. Price $15.00. 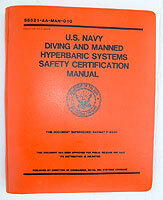 #USNH - U.S. Navy Diving AND Manned Hyperbaric Systems Safety Certification Manual (SS521-AA-MAN-010), October 1987. Six chapters and 12 Appendix's (manual is 1/2 inch thick). Clean, unused manual with nice plastic cover. Hard to find. Price $15.00. #BTOR - The Ocean Realm by The National Geographic Society. Copyright 1978. Hardcover with original dustjacket and 200 pages, loaded with 100's of color photos showing all aspects of sea life. Very good condition. Price $12.00. #BRDS - Rocket Divers - The Deep-Sea Adventure Series from Harr Wagner Publishing Company, San Francisco , Copyright 1967. This was one of a series of basic readers (grades 4-6) that were based on scuba diving. The book has illustrations, multible choice questions and a vocabulary. Ex-library copy with the usual stampings and markings but inside pages are clean. Hard to find outside of the West Coast. Price $12.50. 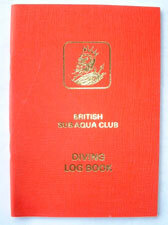 Vintage British Sub-Aqua Club Diving Log Book. 20 pages, measures 4 by 6 inches. New old stock! Price $9.00. #BSKS - Skin & Scuba, a Videopro Manual, by Divers Video Network, copyright 1980. Loose-leaf manual in three-ring binder. Several hundred pages. A complete scuba diving introductory course. This manual was designed to be used in conjunction with a 13 lesson Skin & Scuba System 100U video cassette program. Manual only - no cassettes. Price $10.00.